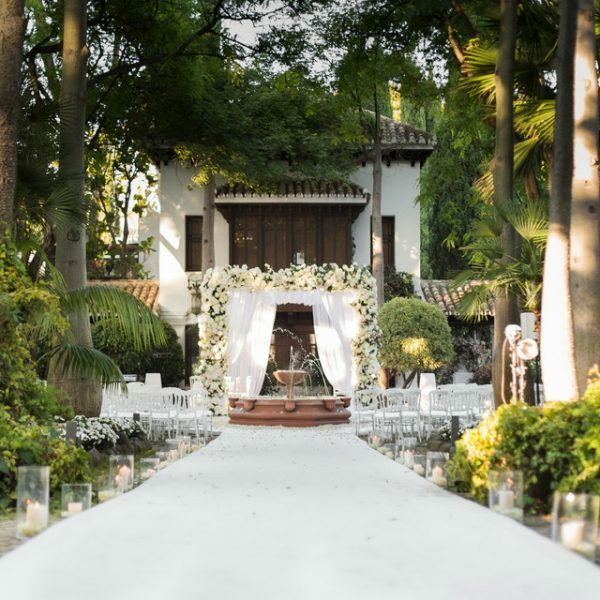 Last summer one of our weddings took place at a beautiful Villa at the Guadalmina Hotel. Salduna Catering and many other suppliers involved made the wedding a success; the clients, their relatives and closest friends were delighted with this special occasion. The ceremony took place at Guadalmina chapel beautifully decorated by Pedro Navarro Event Styling. We had a Coro Rociero (Typical Spanish choir) formed by 12 people singing during the ceremony. Afterwards the guests were taken to the villa for reception drinks & canapés, dinner and dancing until late. Salduna Catering did an amazing job and their gazpacho served in iced glasses was a winner! Lighting is always a big part of our weddings and this time One2One made a fantastic job lighting the tables, beautiful trees and dancing area. The Pedro Navarro team set up the fairy lights to look like stalactites adding a unique touch to the wedding. The table decoration was done using only candle holders of different styles and heights creating a beautiful centrepiece. Sandy coloured table cloths, Napoleon white chairs and special charger plates were used to enhance the table set up. The table numbers were done by Nulki Nulks. For those guests who wanted to take a seat during the dancing time, we had one of the most comfortable chill outs with some soft rugs. Thank you so much to Luis Tenza for covering the wedding and for providing such lovely pictures. As usual thank you so much to all the suppliers involved and special thanks to Salduna Catering and the clients for trusting us to plan and coordinate the wedding.